For the past few weeks, the German news has been full of reports about the “Stuttgart 21” project. “Stuttgart 21” is the re-development of Stuttgart’s main station and the surrounding railway lines. At present, Stuttgart is a “Kopfbahnhof”, meaning that it was built as a Terminus and the tracks end there. Trains go in and out through the same entrance, consequently passengers in high-speed intercity trains change direction when the train stops there and train crews have to change ends to continue their journey. 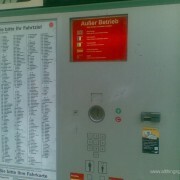 It is not the only such station in Germany. Frankfurt and Munich, for example, were built this way as well. But now the station is to be transformed into a “Durchgangsbahnhof” – one where the tracks run through and out the other side. This is said to save time, because the stops will be shorter – the train crews can stay where they are. 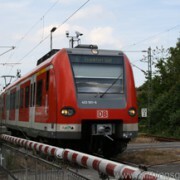 At the same time, new lines should improve connections to Paris and to Stuttgart’s airport. Of course, turning a station round 90° in the middle of a major city was never going to be easy, so the plan is to take the lines underground. This alone may not have caused so much controversy. But Stuttgart’s main station is – or should I say was – a listed building. It was even nominated for the UNESCO’s World Heritage List. The station was first opened in 1922. 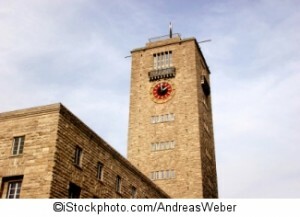 Its facade is made of limestone and bricks and is considered to be one of the most important examples of 20th Century architecture in southern Germany. 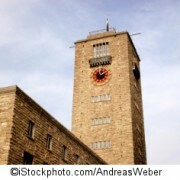 It is located at the end of one of Stuttgart’s main shopping areas, and its clock tower is one of the main features of the city. Part of the Stuttgart 21 project is the demolition of large parts of the station building, and this is one of the main things that the public are protesting against. Up to 100,000 people take part in each demonstration, and some of them have turned ugly with water canons and pepper spray being used by police. I’ve been watching the reports and one of the things that I have noticed, is how prepared Deutsche Bahn and the politicians are to say that everything has long been decided and it’s too late to change anything. They neglect to talk about how much consultation took place at the planning stage, and I have yet to learn exactly why the station has to be partially demolished. German politicians are quick enough to criticise other countries for not respecting UNESCO World Heritage status, and planning laws are usually very strict in their dealings with changes to listed buildings. I think that Stuttgart 21 is setting a dangerous precedent for future projects. And it is not often that the German population protest on the streets in such large numbers. In fact, they are often criticised for just accepting unwelcome political decisions and not protesting. This fact alone should make the politicians in Stuttgart sit up and take notice. When does the last train leave Oberursel during the Hessentag?